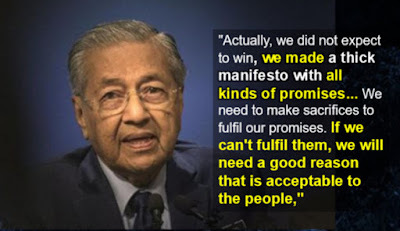 PETALING JAYA • Malaysian Prime Minister Mahathir Mohamad has said that Pakatan Harapan (PH) made too many election promises because it did not expect to win the 14th general election in May. The coalition chairman told PH and Parti Warisan Sabah MPs at a closed-door meeting in Petaling Jaya on Monday night that this was why the new administration was facing a tough time meeting its manifesto pledges. Tun Dr Mahathir also warned about the possibility of a backlash against the new government, according to several sources present at the dinner function. 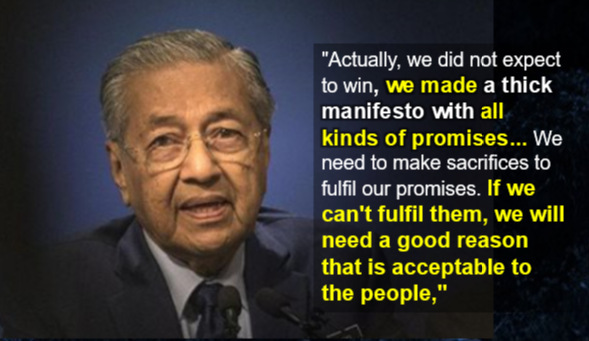 "Actually, we did not expect to win, and we made a thick manifesto with all kinds of promises... We need to make sacrifices to fulfil our promises. If we can't fulfil them, we will need a good reason that is acceptable to the people," said Dr Mahathir. "If we fail to deliver on our promises, the opposition will use it against us and we may be defeated" in the next general election, he added. One example he gave was PH's promise to make the position of opposition leader equal to that of a minister. The Prime Minister said that the promise was made with the expectation that PH would be in the opposition. "But we won, and now it feels uncomfortable to give the opposition leader an equal rank to a minister," he said.